This post was originally published on June 26. Consider it a PSA for Jackson voters. 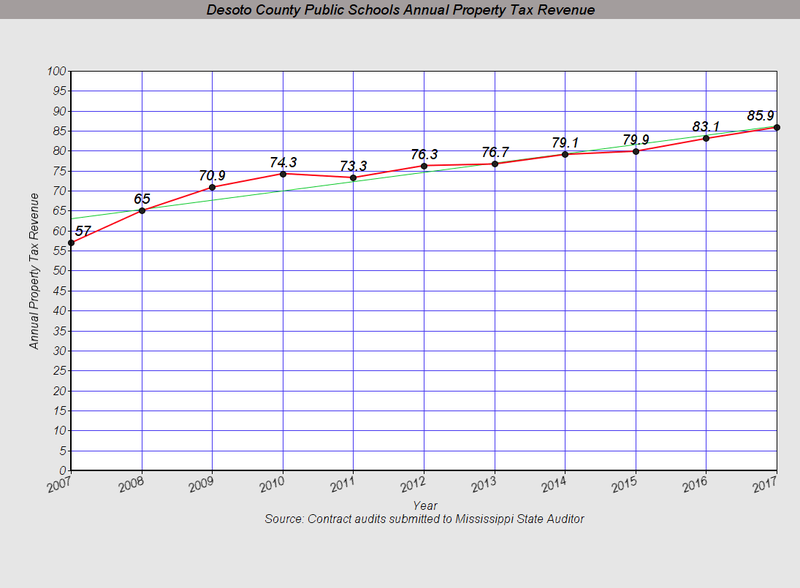 The Jackson Public School District hauled in a record amount of property taxes in 2017 even though student enrollment continued to decline. 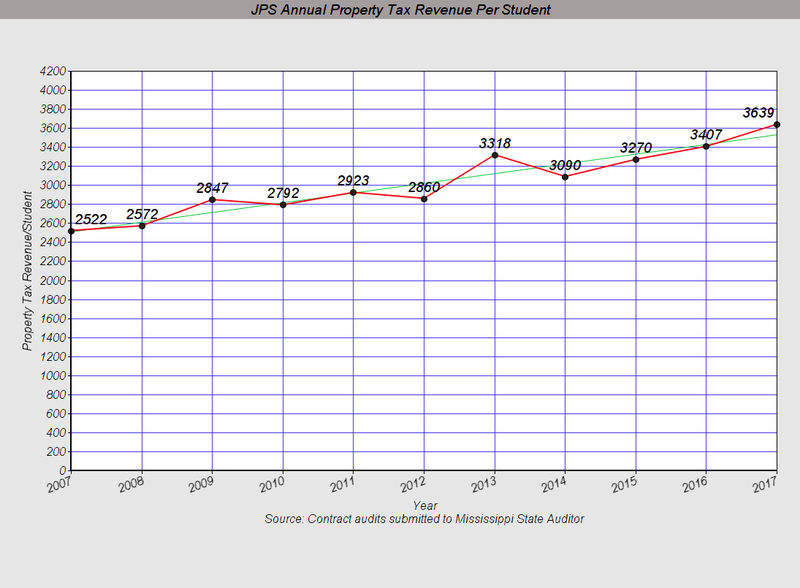 The annual audit states that JPS collected $95.4 million in property taxes while enrollment fell to 26,206 students. 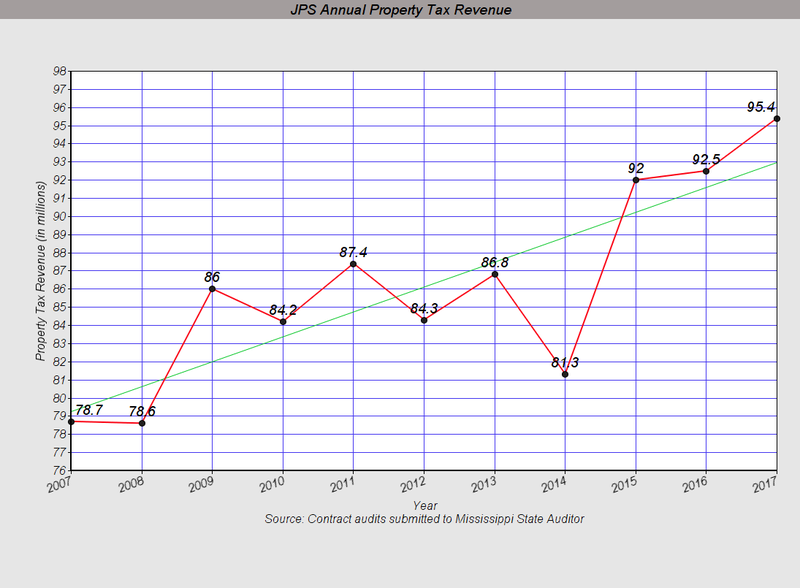 The chart below shows property taxes that fund JPS increased from $78.7 million in 2007 to $95.4 million in 2017 - an increase of 21%. 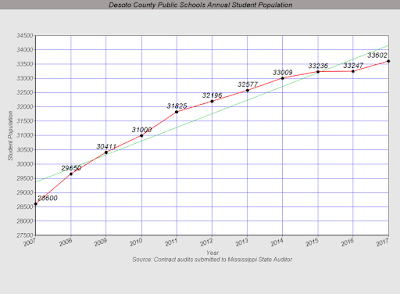 Meanwhile, the student population declined 16% as it fell from 31,191 students in 2007 to 26,206 students in 2018. 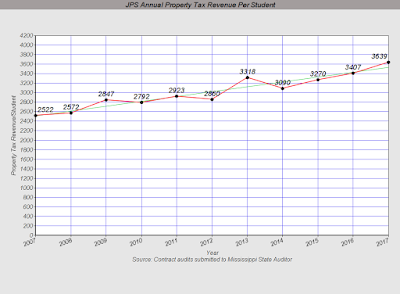 JJ created a new statistic last year: Annual property tax revenue per student. It rose $1,117 since 2007, an increase of 44%. There are those who claim that JPS suffers because it is not a so-called "wealthy" school district. 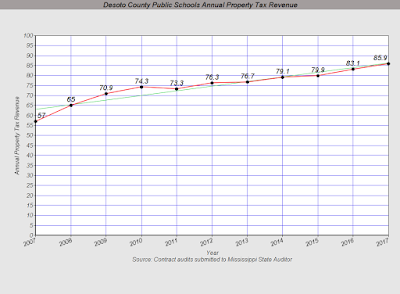 Maybe so but JPS collects more property tax revenue that it ever has and more than any other school district in Mississippi. 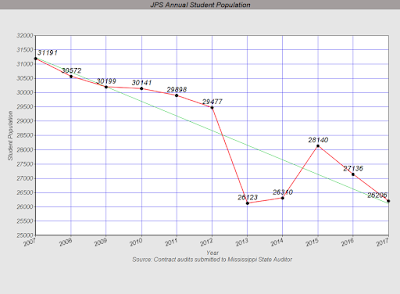 JPS is reckoning with decades of systematic disinvestment in it and its community. 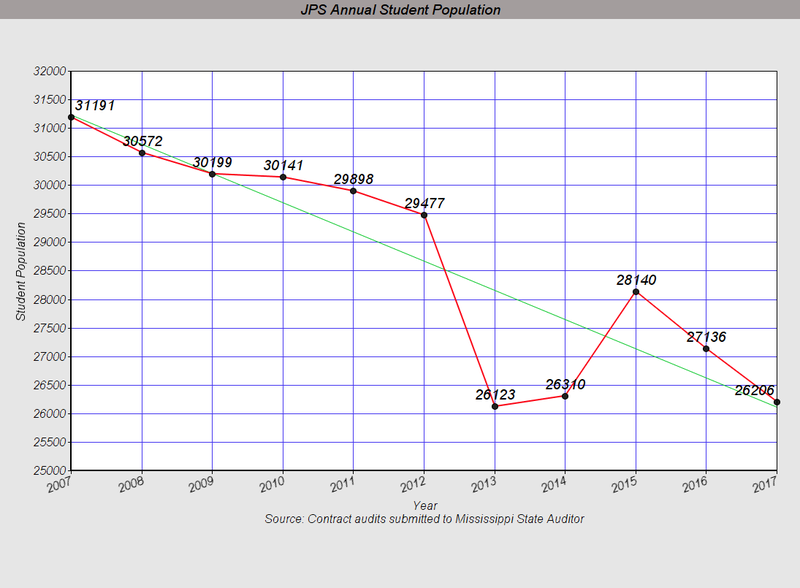 On top of that, JPS has to cope with extremely high rates of family poverty among its students, a declining tax base that affects school funding and, correspondingly, aging and dilapidated capital infrastructure. In short, the odds have been stacked against them for a while. Column. I urge you to think hard about how we, with all of Jackson’s challenges and opportunities, ensure that we can build a school system and a community that keeps children safe and provides them a top-quality education so they can realize their dreams and potential. Perhaps it is Mr. Langford who should try some actual thinking. There is one word that is not mentioned in his column that operated on a shoestring of facts: accountability. Only 38% of the employees at JPS are teachers. Meanwhile 55% of the employees at Desoto and 50% at Rankin are teachers. Their central office staff is a fraction of the nearly thousand employees that populate the JPS central office. Then there is the kicker: JPS spends $2,000 per student more than Desoto. Mr. Langford never seems to mention anything about holding the leaders of JPS accountable for anything. However, it's easier to insult the community than actually examine the facts and think. Keep this post in mind when deciding whether to support the $65 million school bond referendum. 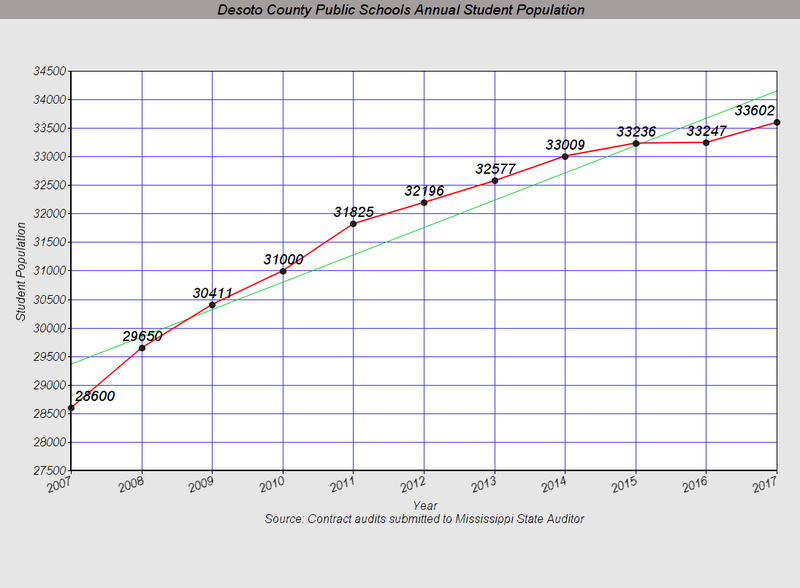 Kingfish note: The numbers get even worse when compared to Desoto County Public Schools. Money not going to the kids. 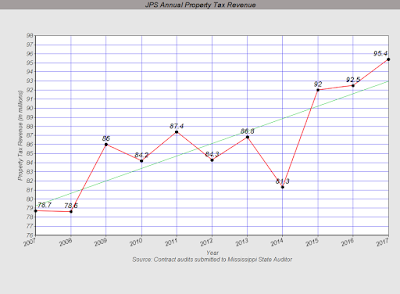 Money going administrators of JPS. Feel Bryant had his chance to help the kids by taking over JPS. No telling what would be uncovered if he did. & the only people who suffer are the kids. This is on Phil Bryant’s hands. He had an opportunity to make s difference, but he did not have the guts or leadership to do so. It makes perfect sense when looking at JPS as little more than a jobs program for local college graduates. I think the administration-class is so entrenched in Jackson that we don't even question that the problem is anything other than a lack of funding. So, we throw more money at it, and nothing gets better. Kingfish, you mentioned claims of JPS suffering "because it is not a so-called 'wealthy school' district". I've heard this same claim from several people, but I've yet to get an explanation of how this phenomena works. Every time I see per student numbers they contradict this statement. All statistics show the wealthiest districts have the lowest per student spending and the poorest districts have the highest. In an article from the Hechinger Report (a decidedly left leaning organization), Mississippi is in fact listed as spending more on poorer schools, just as every number I've ever seen suggests. I would genuinely like to know where the numbers are to support constant claims that we are somehow short-changing poor students. 3:25pm, I have never been successful in getting a documented answer to that question. In every case, the person I ask starts talking about "these kids have more problems so we have to hire social services people." But again, there's never any quantitative analysis, it just "sounds correct" so everyone believes it. JPS is a Black owned enterprise. It is by blacks and for blacks. If Feelbert took it over, they would screech about it not getting better because he took it over. The administrators, teachers, students and their parents are plenty happy with it in its current form. Any lack they have is blamed on white folks keeping them down and there is nothing to be done about it. They are not responsible for making it better since they are not responsible for the shape it is in. 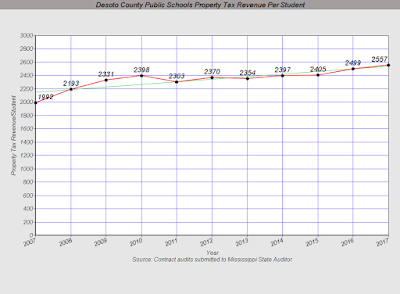 3:25, "we" (taxpayers) are NOT shortchanging Jackson students. JPS leadership is short changing them. They take the tax dollars we intended for the classroom, and they spend it on themselves instead. Then when they burn through it all, they take pictures of the falling apart pathetic buildings and demand another $100 million or so. They never mention that they allocated less than one half of one percent of funds for maintenance. The funds were there, but they were spent on administrator salaries and benefits. 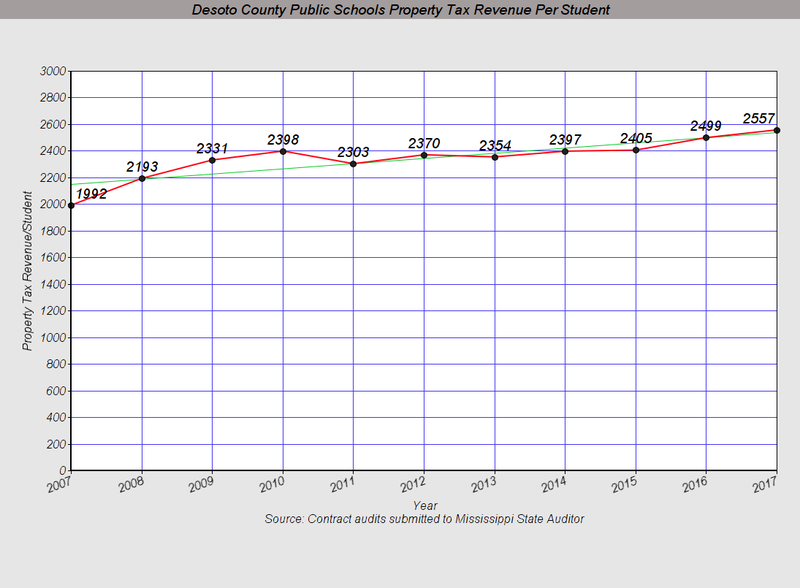 I'm a big believer in education, but I'm not supporting ANY more tax increases until JPS administration is downsized significantly, and at least half of funds received are spent in the classroom! Half is not too much to ask!! Check out those Swiss and Cayman Island bank accounts. Kingfish, do you or anyone on this blog actually care about educating black children? Do you mentor in the schools? Salaries are public record. JPS has administrative salaries that blow the rest of the state's districts out of the water. For example, a school counselor is paid $129,000 annual salary. That's the problem with JPS - it's a money grab for those at the top, all the while the perfomance level of students doesn't reflect the amount of money thrown at those in charge of the schools. Of course we care, as does KF, but it isn't our responsibility. We all want all kids to grow up and be positive contributors to society. Education is the responsibility of the parent(s), not a blog or blog participants. Oh wait, where are the parents? So it then is the responsibility of auntie or grandma. This is great news! Now the underperforming schools at JPS can finally get the resources they need to help students at risk! Oh the higher ups at Butler snow won't mind this. They live in NE Jackson and fatten there pockets while doing so. Taxpayer bailouts... government contracts are really a nice word for government services. These people that support this are all idiots. Read nextdoor Fondren and try to say a negative word and you will be shamed by some loon that sends all 3 of there kids to prep or St. Andrews. It's madness... I guess it's the guilt that they carry for whatever reason as to why they support this. I mentor just as many JPS students as I do Madison, Rankin and DeSoto students. Better question, how many JPS students are mentored in the free time of the school counselors making $129k? If Bryant had taken over JPS he would have been branded as the biggest bigot since Byron de la Beckwith. The efforts to fix the issues would have been fought at every turn. Lumumba's head would explode. I talked to someone who knows and he said this will be the last educational increase the city will need for a long, long time. 9:32, when he refers to a long long time does he really mean until next year? Lay 3,000 JPS employees off and see how it changes. The scores will remain but the financial bleeding stops. It’s useless and mind numbing as to how it got this way. But if we say anything we are labeled racists. Either you are laying on some heavy sarc, or, you are the most naive moron that's posted here for a looooong time. @8:57 AM - "White guilt" is a form of racism. It keeps minorities dependent on the man. Perhaps it is Mr. Langford who should try some actual thinking. There is one word that is not mentioned in his column that operated on a shoestring of facts: accountability. Only 38% of the employees at JPS are teachers. I can't argue with that Kingfish. JPS has the funds, its just so damn top-heavy and no one wants to come out and say it. District lines need to be redrawn. The focus should be on teachers, not administrators. I just put my house in Jackson on the market. Hello Madison!